Steve takes on 100 Miles! Steven McCombe rode in the Manchester 100 Miles in memory of his friend and dear mother-in-law, Doreen Ball. Steve’s efforts were fantastic, doing it under 10 hours and also raising over £500. Well done! We have guaranteed places in the 100 Miles cycling sportive in London – Prudential Ride London. If you are inspired by Steve’s efforts, check out our Cycling section. Mark takes on the Grand Daddy of bike challenges – Lands End to John O Groats! My Dad had MSA before he died. The condition isn’t pleasant and as a family we struggled to understand what was happening to him and how, if at all we could help.At the time we didn’t know about the MSA Trust, but now that I have discovered it, I realise that the Trust needs as much help as possible to promote its messages and provide support to families affected by MSA. I am a road cyclist and as such am well aware that the Grand Daddy of UK bike challenges is the “End to End”. Riding from Lands End to John o Groats, around 980 miles. So in May 2018 I decided to take the challenge and ride the route over 9 days averaging around 110 miles a day. I rode with 3 others to share the experience with and we had a support van which made life a lot easier, carrying our clothes, food etc. The weather was simply wonderful for all 9 days , which was a real bonus. Seeing the change in countryside from south to north along with the different architecture and towns and villages was a wonderful experience I will cherish forever. I set up a Virgin Money Giving page and sent a link to all my contacts. I updated daily on Facebook and pleased to say that friends all gave generously. In the end I was able to raise £3,800 for a wonderful charity which isn’t as popular and in the news as some of the others.The MSA Trust is now my number one choice for any future fundraising efforts and if you can help at all please do! 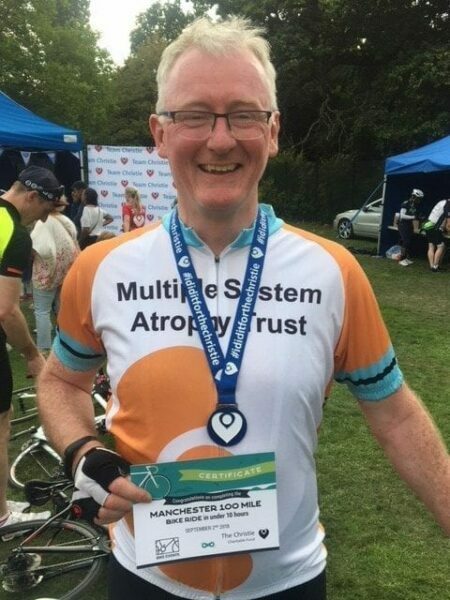 Mark Bremner is one of our fantastic cyclists who took on this challenge over 9 days! Well done and thank you for making us your number one choice! We look forward to your next challenge. 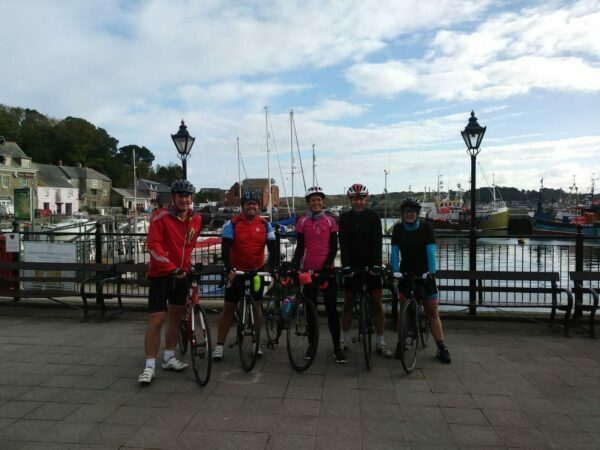 Chris Jennions and his team (Claire, Kym, Steve and Nathan) got together and cycled 250 miles from Padstow to Bath, raising £831 for MSA Trust! Thank you everyone – what a great way to honour Ian’s memory.